Yesterday I attended the funeral of a dear friend who succumbed to ovarian cancer at the age of 79 after a 12-year valiant battle. Her granddaughter, with the voice of an angel, sang her favorite song – her life’s motto – and it was quite poignant. 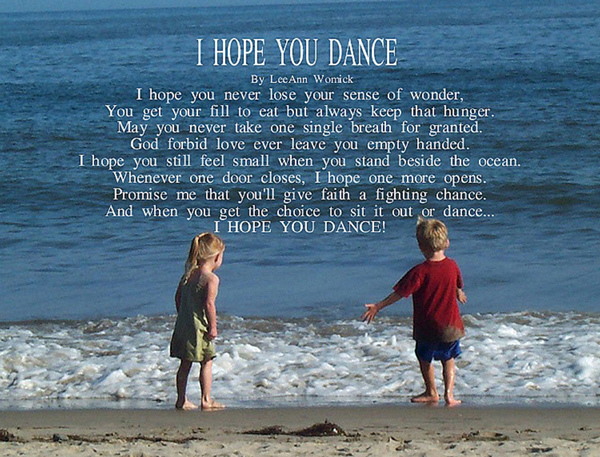 The song is by Martina McBride entitled, “I Hope You Dance.” Here is a synopsis of the lyrics that resonated with my spirit. Our lives are filled with constant motion. We tend to go through each day doing what needs to be done, rarely taking notice of what we’re actually doing and rarely taking chances due to fear of failure. We tend to be stuck on the hamster wheel of “getting it done faster and/or right;” equating it with being better as well as sticking to our “normal” because it is safe. When is the last time you stopped, took a breath and actually took notice of your daily routine? When is the last time you took a risk, no matter how small? Life is fragile and brief. Being present helps you to enjoy life to the fullest. Taking risk adds variety, change and opportunity leading to a purposeful, well life. No matter your current health situation take notice, take a chance, seize opportunity and, in the words of Martina McBride, I hope you dance.